What is the most common type of coaxial cable used to carry video signals? The most common coaxial type to carry video signals is RG-59 B/U type 75 ohm coaxial cable. In what kinds of applications is coaxial cable used? The coaxial cable family is commonly used in data processing equipment and information systems. Do coaxial cables degrade over time? Yes. Over time, a coaxial cable will degrade and need to be replaced in order to maintain the integrity of the signal. What is the difference between coaxial, triaxial, and twinaxial cable? Coaxial cable uses two conductors that share a common axis. In triaxial cable, there are three conductors that share an axis. Twinaxial is different because it uses two twisted conductors surrounded by a common shield. The conductors in twinaxial cable don’t technically share an axis but are twisted together, giving the cable the “feel” of a shared axis. Which types of coaxial cable does Allied carry? We carry a large selection of coaxial cable products including triaxial, twinaxial, low loss coax cable, low noise, high power, and high temperature options. 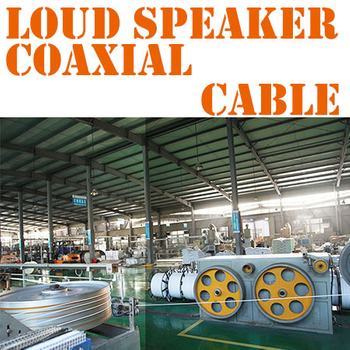 We also distribute RG coax cable products manufactured by Belden Cable and Alpha Wire Company. What should I consider when deciding which Coaxial Cable to buy? Coaxial Cabling is designed for the transmission of high frequency signals with a minimum of loss. Coaxial wire and cable is offered with various configurations, and the most common ones are listed on the previous page. When purchasing coaxial cable, you should consider impendence, environmental temperature, working voltage, signal loss at specific frequencies, power rating and cost. If a type of coax cabling is not listed please contact our sales department. Coaxial cable is a type of copper cable specially built with a metal shield and other components engineered to block signal interference. It is primarily used by cable TV companies to connect their satellite antenna facilities to customer homes and businesses. It is also sometimes used by telephone companies to connect central offices to telephone poles near customers. Some homes and offices use coaxial cable, too, but its widespread use as an Ethernet connectivity medium in enterprises and data centers has been supplanted by the deployment of twisted pair cabling. In recent years, coaxial cables have become an essential component of our information superhighway. They are found in a wide variety of residential, commercial and industrial installations. From broadcast, community antenna television (CATV), local area network (LAN), closed circuit television (CCTV) to many other applications, coax has laid the foundation for a simple, cost-effective communications infrastructure. Coaxial cable received its name because it includes one physical channel that carries the signal surrounded -- after a layer of insulation -- by another concentric physical channel, both running along the same axis. The outer channel serves as a ground. Many of these cables or pairs of coaxial tubes can be placed in a single outer sheathing and, with repeaters, can carry information for a great distance. Coaxial cable was invented in 1880 by English engineer and mathematician Oliver Heaviside, who patented the invention and design that same year. AT&T established its first cross-continental coaxial transmission system in 1940. Depending on the carrier technology used and other factors, twisted pair copper wire and optical fiber are alternatives to coaxial cable. Coax cables have concentric layers of electrical conductors and insulating material. This construction ensures signals are enclosed within the cable and prevents electrical noise from interfering with the signal. The center conductor layer is a thin conducting wire, either solid or braided copper. A dielectric layer, made up of an insulating material with very well-defined electrical characteristics, surrounds the wire. A shield layer then surrounds the dielectric layer with metal foil or braided copper mesh. The whole assembly is wrapped in an insulating jacket. The outer metal shield layer of the coax cable is typically grounded in the connectors at both ends to shield the signals and as a place for stray interference signals to dissipate. A key to coaxial cable design is tight control of cable dimensions and materials. Together, they ensure the characteristic impedance of the cable takes on a fixed value. High-frequency signals are partially reflected at impedance mismatches, causing errors. Characteristic impedance is sensitive to signal frequency. Above 1 GHz, the cable maker must use a dielectric that doesn't attenuate the signal too much or change the characteristic impedance in a way that creates signal reflections. Electrical characteristics of coax are application-dependent and crucial for good performance. Two standard characteristic impedances are 50 ohms, used in moderate power environments, and 75 ohms, common for connections to antennas and residential installations. Hard-line coaxial cable relies on round copper tubing and a combination of metals as a shield, such as aluminum or copper. These cables are commonly used to connect a transmitter to an antenna. Triaxial cable has a third layer of shielding that is grounded to protect signals transmitted down the cable. Rigid-line coaxial cables are made up of twin copper tubes that function as unbendable pipes. These lines are designed for indoor use between high-power radio frequency (RF) transmitters. Radiating cable mimics many components of hard-line cable, but with tuned slots in the shielding matched to the RF wavelength at which the cable will operate. It is commonly used in elevators, military equipment, and underground tunnels. In the home and small offices, short coaxial cables are used for cable television, home video equipment, amateur radio equipment and measuring devices. Historically, coaxial cables were also used as an early form of Ethernet, supporting speeds of up to 10 Mbps, but coax has supplanted by the use of twisted pair cabling. However, they remain widely in use for cable broadband internet. 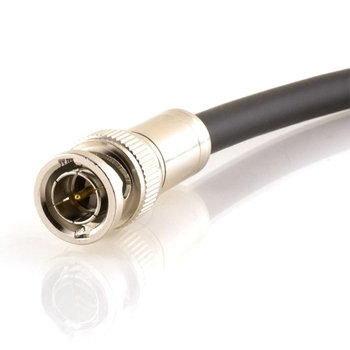 Coaxial cables are also used in automobiles, aircraft, military and medical equipment, as well as to connect satellite dishes, radio and television antennae to their respective receivers. Depending upon the application, many different types of conductor constructions may be found in coaxial cables. Solid copper conductors are popular on many CCTV installations. Solid conductors provide less chance for distortion and line loss than copper covered steel. However, copper is a soft material and will break if repeatedly flexed. It is best used on permanent installation. Many small strands of copper can be used to make up any gauge size. Stranded conductors provide increased flexibility over solid conductors. This design has become popular for use on pan and tilt cameras, robotics and other applications that require repeated flexing. In some applications strength is a key requirement. Steel conductors covered with copper may be needed to prevent breakage in an active environment. Copper covered steel conductors provide added strength and RF support and are often used in CATV and MATV applications. The inner conductor of a coaxial cable is separated by an insulating material from the surrounding shield(s). This "dielectric" material is often chosen in order to maintain consistent electrical properties and minimize signal loss. The result is a clear, trouble-free transmission. Note: foamed dielectric materials provide a lightweight composition suitable for many coaxial constructions. Foaming the dielectric also contributes to increased clarity in high-speed transmissions. PE-Solid Polyethylene: good for low-temperature applications. FPE-Foamed Polyethylene: provides lower attenuation and capacitance than solid PE. Air-Spaced: supports a lower dielectric constant than Polyethylene while allowing for a small diameter cable size. FEP-Fluorinated Ethylene Propylene: excellent for high temperature and plenum applications. Low dielectric constant for clear signal transmission. FFEP-Foamed Fluorinated Ethylene Propylene: extremely low dielectric constant. In coaxial applications, shielding is an important part of the overall composition of the cable. Shielding not only protects the loss of signal in the high-frequency application but also helps to prevent EMI (electromagnetic interference) and RFI (radio frequency interference) in the circuit. There are three popular types of shielding available from Coleman/CCI: overall foil, braid and foil/braid. Foil shields are commonly used as an effective, low-cost application to prevent EMI/RFI interference. The construction consists of a layer of aluminum with a polyester backing that is overlapped to provide 100% coverage. Braid shields are constructed of thin strands of aluminum, copper coated aluminum tinned copper or bare copper that are interwoven. Many different coverages are available with 40-67% aluminum and 95% copper being the most popular. High percentage braided shields offer an excellent protection from EMI and RFI and are popular in CCTV applications. Foil/braid shielding is extremely popular with CATV and MATV applications. The 100% aluminum foil is accompanied by a braided shield to provide improved protection from EMI and RFI. Construction consists of a foil-braid-foil-shield. Construction consists of a foil-braid-foil-braid shield. Very popular for CATV and MATV applications in high EMI/RFI locations such as urban areas. PVC-Polyvinyl Chloride: Very flexible thermoplastic material commonly used for general purpose coaxial products. Temperature rating: -40 to 80°C. PE-Polyethylene: A thermoplastic material which exhibits excellent electrical properties. Often used in direct burial applications. Temperature rating: -55 to 85°C. FEP-Fluorinated Ethylene Propylene: A thermoplastic material with good insulating properties. Excellent in high temperature, plenum, and chemical environments. Temperature rating: -50 to 200°C.